Allison Foley, Greenwich, prepares her Balsamic Roasted Tomato-Spinach-Bacon Pie during the 44th Pillsbury Bake-Off(r) Contest, held Monday, April 12, 2010 at the Waldorf=Astoria Orlando and Hilton Orlando Bonnet Creek hotel. Foley is one of 100 finalists from around the country competing for a $1 million grand prize.The grand prize winner will be announced live Wed., April 14, on "The Oprah Winfrey Show." Just getting an opportunity to compete in the Pillsbury Bake-Off Contest is an honor, but we were hoping our local cook was going to bake her way to $1 million. 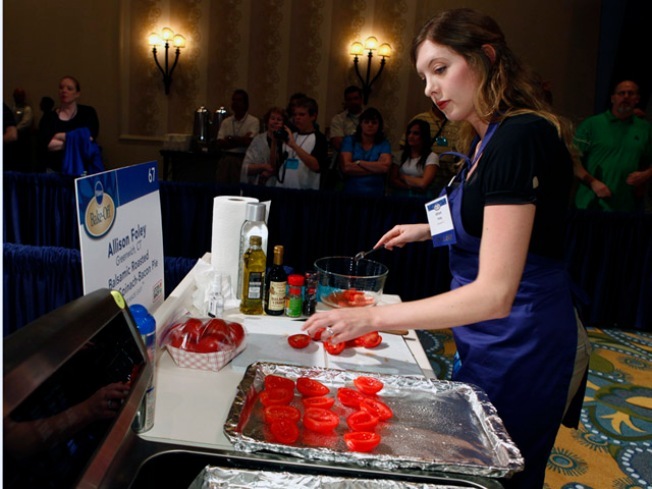 Allison Foley, of Greenwich, competed in the 44th annual contest on Monday in Orlando, Florida and presented the judges with the Balsamic Roasted Tomato-Spinach-Bacon Pie recipe that got her to the finals. The winners were announced on Monday night and, unfortunately, Foley was not among them. Four category winners were named and the closest winner to Connecticut is Niki Plourde, of Gardner, Massachusetts. She won the breakfast and brunches category with her Tomato-Basil Eggs Alfredo in Bread Baskets. Evelyn Henderson, of Roseville, California, won the entertaining appetizer category with her Salmon Pecan-Crusted Tartlets. Kellie White, of St. Louis, Missouri, won the "Dinner Made Easy" category with Zesty Lime-Fish Tacos and Sue Compton, of Delanco, New Jersey, won the sweet treats category with her Mini Ice Cream Cookie Cups.